Vivitek is the first manufacturer to release a lamp-free home cinema projector in the guise of the H9080FD – a feat made possible with the adoption of Luminus Devices' PhlatLight technology – and it won't be the last. The unit utilises a module containing different-coloured LEDs (R, G and B) housed on individual chips to provide the light source. The resulting beam is then fed through Texas Instruments' 1080p DMD chip to project images. Simple stuff really, but incredibly clever in practice. It's a system that yields several benefits. Unlike traditional single-chip DLP projectors , there's no call for a colourwheel, so images do not suffer (however slight) with DLP's colour-fringing rainbow effect. LEDs also have an incredibly lengthy half-life. It's claimed that the PhlatLight engine will still be going strong up to 20,000 hours from purchase. That's 18-20 years if you watch one film a night, every single night of the week. Impressive. In all likelihood, you'll never need to replace the light source during the life of the unit. This makes LED tech particularly appealing for users in the corporate or educational markets. Compare that to the bulb in a JVC DLA-HD750, for example, which has a claimed 2,000 hour lamp life. By the same criteria, that'll last just under two years, and a replacement costs around £250. So, to get the same longevity, you'll need to spend around an extra £2,500 for a normal home cinema projector. There is, however, a downside to this fledgling technology. Currently, LEDs are like the trendy kid in class; they're popular, colourful, but none too bright. And so, this projector does have a Lumens deficiency compared to its rivals. In fact, in normal ambience (room lights switched on, for instance) you can't really see anything from ten feet away. The H9080FD is not a projector for anything less than a fully light-controlled room, and, unless you're happy to watch EastEnders in a blacked-out environment, it's not particularly designed for casual use. Nope, this is a good, old-fashioned, honest-to-garden home cinema projector and, in that sense, it is more than fit for purpose. Also hidden within its chunky build is the same Gennum 9450 video processor found in the Planar PD8150. One of the more interesting features of this chipset is the option to manually change the refresh rate – seemingly without adding unnecessary artefacts. To be honest, you'll probably never stray far from the 'Auto' frame rate mode, which matches the incoming signal, but tweakers and purists will be glad of its inclusion. More important though, is this specific processor's scaling and de-interlacing prowess. It does such a good job with upscaling standard-definition video that I advise you turn off any equivalent processing in the source. It doesn't make SD content look as good as HD images – that's a fallacy perpetuated by Looney Toons – but it holds up very nicely indeed, even when blown up above 100 inches. Edge enhancement succeeds in this instance where it often fails in others, and the pictures retain a filmic quality even with noise reduction switched on. High-definition video is staggeringly detailed on the H9080FD, and 24 frame footage moves like a female ice dancer. Indeed, I would argue that the pictures are worse at 90 per cent of cinema multiplexes. There's also proof positive that an LED lighting system enhances colour saturation, especially when combined with TI's DLP Brilliant Color system. The reds are simply breathtaking, even on the picture presets. Of course, you can also calibrate to your heart's desire with an exhaustive set of tools. I'm less enamoured by the contrast level, which is mainly dampened by the lack of true brightness. That said, black levels are good and the dynamic iris does a fair job without being too overt – it's neither too loud nor too crazy in its lightening and darkening of scenes, so you'll probably opt to keep it on. My other quibble concerns the LED driver. Although the model makes a virtue of the whisper-quiet fans it utilises, there was still a faint buzzing sound on our review sample. This changes in pitch during certain sequences as the driver needs to increase the voltage depending on the brightness required. 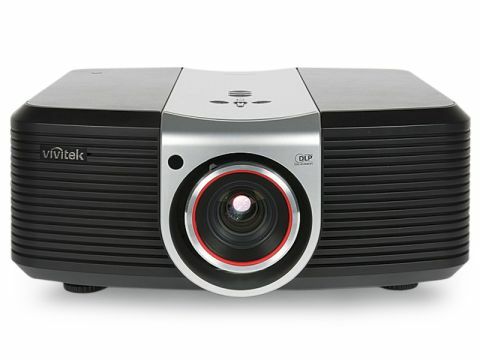 It transpires that this is an inherent issue with the technology itself and is not unique to this specific projector. And Vivitek has greatly lessened the effect by adding acoustic foam internally. So neither of its flaws are insurmountable, and its many unique properties make the H9080FD an interesting proposition. Unfortunately though, many may be put off by the cost to even give it an audition. As with any new-fangled technological breakthrough, there's a premium attached, and ten grand may seem too much, regardless of its tasty light engine and superb longevity. It's hard to argue otherwise too, especially considering most rivals are roughly half the price. However, there's something exclusive about being a trendsetter.